JUNE 15, 2010 (ERATH, LA) -- On May 28th,2010, The Acadian Museum of Erath inducted Lt. General Russel L. Honoré (Ret.) into its Order of Living Legends. General Honoré is best known for serving as commander of Joint Task Force Katrina, responsible for coordinating military relief efforts for Hurricanes Katrina and Rita-affected areas across the Gulf South . Following the ceremonies, General Honoré signed copies of his book Survival: How a Culture of Preparedness Can Save You and Your Family from Disasters. All proceeds from the sales of the book were donated to the Acadian Museum. Shown in the photograph are: (L to R): Warren A. Perrin, Acadian Museum Director, General Curney J. Dronet, Lt. General Russel L. Honoré (Ret. ), inductee, and General Robert LeBlanc. “As a college student, I was extremely inspired by General Honoré’s talk on patriotism and freedom. It was particularly poignant since the event was held on Memorial Day weekend and many veterans were in attendance”, said Bruce Perrin, event facilitator. Shown in the photograph are: (L to R): Andrew Perrin, member of the museum’s Executive Committee, presenting inductee Lt. General Russel L. Honoré (Ret.) with the portrait that he drew of the inductee. Since his retirement from the military, Lt. General Honoré has served as Emergency Preparedness contributor to CNN Worldwide. He focuses exclusively on disaster preparedness, response, and recovery activities, with multi-sector integration of emergency management. CNN reporter Barbara Starr followed General Honoré during the recovery effort, and the network is expected to cover the event. 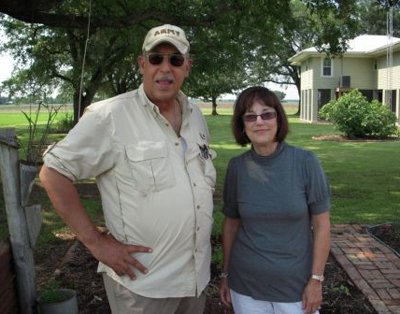 Mary Perrin hosting General Honoré and his wife Beverly at the Perrin Farm in Henry. (L to R): General Honoré and Mary B. Perrin. Prior to the event, the general toured the Acadian Museum, the Louisiana Military Hall of Fame & Museum in Abbeville, as well as the southern part of Vermilion Parish to observe the area’s recovery since Hurricane Rita. 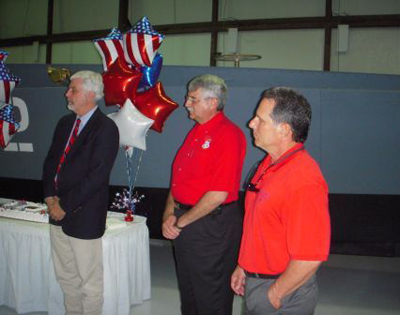 Hosting General Honoré at the Louisiana State Military Museum in Abbeville are: (L to R) Cliff Deal, Office of Secretary of State, Director of Museums, Francis Plaisance, Abbeville City Councilman and Mayor Pro Tem and Abbeville Mayor Mark Piazza.